There is something about the Southwestern landscape that inspires people. Whether it's the mountains and deserts, the distant horizon, or the technicolor sunsets I don't know. But, something about this place sparks people's imagination. Case in point - Aldo Leopold. Something happened while Leopold was in Arizona and New Mexico that drove him to write A Sand County Almanac and to think about conservation in a new way. We visited the cabin where he lived and worked in Tres Piedras, New Mexico and saw some of what inspired Aldo. Tres Piedras, a small town in the forest northwest of Taos, is home to a Carson National Forest Ranger Station. 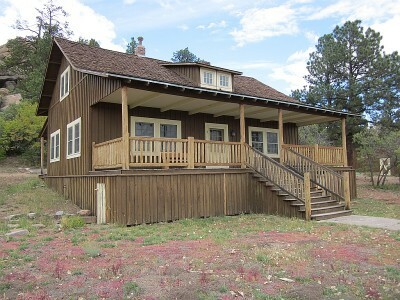 Less than a mile from the modern ranger station is the home of Aldo Leopold when he was Deputy Forest Supervisor for the Carson National Forest. We scheduled a tour with one of the Carson National Forest Rangers who was able to tell us about Aldo Leopold while he worked for the Forest Service in New Mexico. Aldo Leopold was Forest Supervisor for the Carson National Forest from 1911 to 1913. The cabin is a two-story, Craftsman-style, wood home built in 1911 for the new Forest Supervisor. It was occupied by a succession of Forest Supervisors and used for many years. After decades of wear and tear the cabin was restored in 2006 to preserve the structure and its history. A team of historians, architects and archaelogists worked for 15 months to preserve the cabin for years to come. Now used for educational programming and small events, the 1911 Forest Supervisor cabin in Tres Piedras is a monument to Aldo Leopold and the birth of conservation. It's worth a call ahead to schedule a ranger-led tour and see some of what inspired Mr. Leopold.